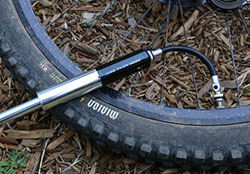 A portable mini bike pump is a must-have accessory that you should take with you on every trek. Whether you throw it in a backpack or attach it to your mountain bike frame directly, it’s good to have it on hand in case of an emergency. When you’re on a challenging mountain or road trail in the middle of nowhere, there’s nothing worse than getting a flat tire. A top-notch bike pump will make sure that you don’t have to take that long walk back. With that being said, not any old pump will do. Since mini pumps are typically needed when you least expect it, they need to be ultra portable and very efficient. Who wants to spend an hour trying to inflate a single tire? Here are some of the best mini bike pumps on the market that are ultra portable, durable, and effective. This miniature pump from Pro Bike Tool is built for road bikes. It measures under 9 inches long, allowing it to fit in any pocket or pack. If you’d rather attach it to your bike directly, it does come with a velcro strap. The pump comes with a flexible hose that is stored in the handle of the pump. The hose also has interchangeable Presta and Schrader valves for versatility. With a pressure capacity of 100 PSI, this pump is very versatile. It’s made from aluminum and is crafted with CNC technology for precision. In total, the pump measures roughly 8.8 inches in length. It can be attached to the bike frame with the included bracket. The pump has a thumb lock to create a tight seal, a dust cap, and interchangeable valves. The Blackburn Mammoth is a versatile pump that allows you to switch into high-volume or high-pressure modes. It’s a thicker option that’s very effective for both mountain and road bikes. Because it’s not as small, the pump is also more comfortable to use. It has a TwistGrip valve lock and an included bottle cage mount. In total, the pump can achieve a maximum pressure of 120 PSI. This pump is available in two different sizes, allowing you to choose the best option for your bike. The medium size is thicker to achieve more volume while the smaller option is great for achieving pressure. Both feature an aluminum body and come with a composite frame bracket. They come with a flexible ABS hose to make using the pump a cinch. The pump is also available in a handful of bright colors to match your bike. This pump from Crank Brother is simple but effective. It has a sleek aluminum body that measures over 12 inches in length. It’s compatible with both Presta and Schrader valves without having to switch out any components. The back of the pump features a thumb lock to latch onto the valve and create a tight seal. In total, the pump can achieve a max PSI of 100. What Makes a Great Mini Pump? Whether you’re on a winding mountain trail or on a paved road, it’s important to keep things light. Carrying too much gear will make you feel encumbered, which could affect your performance. That’s why mini pumps are so great. They’re small and capable of fitting in your water pack or pocket. When you’re choosing a pump, it’s good to find the longest option you can carry with you. One of the biggest downsides of a smaller size is that it will take longer to fill your tire. Luckily, many long and slender options are available. They’re perfectly portable while still giving you enough power to inflate your tires when needed. Because the pump will be going with you wherever you ride, you need to choose a durable option that can withstand the sun, cold, and anything else the trail throws at it. Many resilient metal options are available. However, the area to pay close attention to is the rubber seal. The seal is responsible for making the pump air tight, allowing pressure to build up. Unfortunately, a cheaper rubber seal will dry out and crack the more it’s exposed to the elements. When it breaks, the pump won’t be effective at all. To ensure that the pump is as portable as possible, it’s not uncommon to see some very poorly-designed pumps that are just difficult to use. The easiest options to use often include a flexible hose. This ensures that you don’t have to get into an uncomfortable position to just inflate the tire. While pumps without the hose are still effective, you may find it more difficult to get a proper seal over the intake valve. Not all pumps are made the same. There are a few different types of pump available based on design and use. While any pump can be used to get the job done, you may find that a specific type is more suited for your needs. Pumps designed for the mountain trail are quite small and compact. They typically measure less than 25 centimeters in length. Depending on the particular model and manufacturer, the pump may come with mounting equipment to attach it to the bike frame. However, most are small enough to keep in the small pocket of a water pack. These pumps are designed to provide you with a high volume of air. Mountain bike tires are thicker to absorb the impact of rocks and debris. They only require a PSI in the range of 20 to 40, but they need a lot of air. To provide it, the barrel of the pump is a bit thicker than other mini options. The thicker diameter allows it to push more air. These pumps may look similar to the previous option, but they are specifically designed to accommodate the needs of road bikers. Road bikes have the opposite requirements of mountain bikes. They don’t need a lot of air, but they do need a lot of air pressure. In fact, most road bikes need between 80 and 120 PSI depending on the rider’s body. To help deliver the high pressure, mini pumps for road bikes are thinner. The thin design helps you push even more air in as the pressure increases. Attempting to do this on a thicker pump would be very difficult. Because the pump is so small, be prepared to spend some time getting to the right pressure level. These pumps are great for both mountain and road biking. It’s a great option that provides the best of both worlds. They are equipped with a valve that can be used to manipulate the pressure or volume. This makes it possible to get the best results for your particular bike. If you’re on a mountain bike, you can opt to get more volume. If you’re on a road bike, make the pump focus more on pressure instead. The pump will change the way it operates based on the mode you’ve selected. If you want more volume, it will change to a dual-stage pump that adds air on both the compression and expansion. These pumps are a customized option that are attached directly to the bike. They’re more suited for road bikes. However, they’re longer design and increased air volume makes them effective on mountain bikes as well. 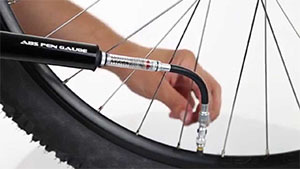 The barrel of the pump is often placed parallel to a specific tube of the bike. It’s often well-hidden. The pump is then placed in the front of the bike in the form of a spring-loaded handle. Simply pump the handle to operate the pump and inflate the tire. Mini bike pumps can be a huge lifesaver when you’re stranded with a flat tire. They can get you back up and riding in no time, allowing you to get home safely. With their small size and ease of use, there’s no reason not to have one with you at all times.